The winners of the League of Ireland are set to play the winners of the Northern Irish Premiership in a new cross-border competition. 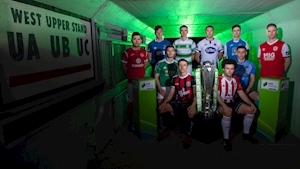 The two-legged final was announced today at the launch of the new SSE Airtricity League season. The game, which will be played at the end of the upcoming 2019 season, will see the Champions of the SSE Airtricity League and the Champions of the Danske Bank Northern Irish Premiership go head-to-head. On the new final, Mr Gavin said: “That intrigue will be significantly enhanced by the introduction of a new cross-border competition which will see the Champions of the SSE Airtricity League and the Champions of the Northern Irish Premiership face each other. The League of Ireland campaign kicks off this weekend with reigning champions Dundalk beginning their title defence against Sligo. Dundalk have already picked up the first piece of silverware of the new season, beating Cork City 2-1 in the President’s Cup. It was their first time winning the trophy since 2015. In the Northern Ireland Premiership, which will finish in May, Linfield have a six-point lead at the top of the table.